Not All Who Wander Are Lost: When pretty colors aren't that pretty . . .
On March 17th, we had the privilege of celebrating Rachel's birthday with her. She got Hut 10 and Katie whipped up some basic, but great grub for Rachel. Major kudos to Katie since it was her day off and did what she always does, cook. Rachel wanted a basic dinner because our dining hall usually makes more complex dishes. Katie made chicken wings, mac & cheese, cake, and other yummy stuff I can't remember to go with Rachel's favorite drink - Pepsi (sometimes mixed with Rum). B-Nelson hiding in window sill of Hut 10 (photo by Rachel J.). Outside of having stupendous company, a yummy dinner, and being in Antarctica, I think Rachel might have gotten the sweetest present of all - a sunset that I'm not sure I have ever seen matched in the world, not even in the Pacific or Atlantic oceans. Fast forward to this week and I was attending another birthday party in Hut 10. Papa Bravo didn't have a great sunset, but Cathy and he did whip up some great Cuban sandwiches and Cuban style beans and rice. At his party, Papa Bravo said he used to live in Batman in a Southeastern US state. I can't remember which state and can't google it. Are there any other superhero towns out there? Where is Batman? As for me, I just got done with a work order in medical. It seems they didn't want gansta rap to be playing in their waiting room . I thought they were setting a trend and were soon going to be outsourcing their new idea to the world, but maybe not. This week is a short week. We get a two day weekend which I have mixed feelings about. Normally, I'd get to go out and play, ski, etc. However, I can't do that this weekend. 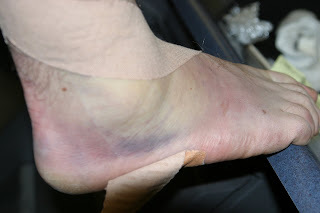 I managed to sprain my ankle Monday night and that leads into the theme of this blog 'when pretty colors aren't that pretty . . . ' The pictures should speak for themselves. 4 days since the sprain. 4 days since the sprain, notice the pretty colors on top. Ouch! That hurts all the way over here! My condolences - I hope it's feel (and looking!) better soon. So.. 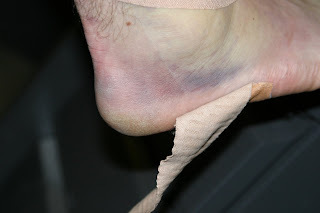 I've never managed to sprain my ankle bad enough that in colors like that. How'd you do that? nice contrast of beautiful and disgusting pictures in this post breadman. I watched Pitt at Roll Call and two of their games were observed by the one and only DZP!! He is at UVA for a PhD in Physics...whoda thunk it? Thanks for the condolences! I'm still not active, but I'm definitely healing. Only a few of those pretty colors are left over and they are down by my toe. I sprained it by landing near the toe and rolling it forward and to the outside at the same time.